finds the minimum cost flow in the graph g with sd1, sd2, … vertex supplies or demands. finds the minimum cost maximum flow between source vertex s and target vertex t in a graph g.
finds the minimum cost flow between source s and target t, with the required flow d.
finds the minimum cost flow in a graph with cost matrix m.
returns the value of "property". FindMinimumCostFlow finds a flow of minimum total cost from a set of supply vertices to a set of demand vertices in a graph with capacity constraints and edge costs. By default, the minimum total cost is returned. Matrices and SparseArray objects can be used in FindMinimumCostFlow. 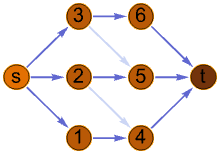 For undirected graphs, edges are taken to have flows in both directions at the same time and same capacities. Self-loops are ignored and parallel edges are merged. FindMinimumCostFlow[data,…,"OptimumFlowData"] returns an OptimumFlowData object flowdata that can be used to extract additional properties, using the form flowdata["property"]. FindMinimumCostFlow[data,…,"property"] can be used to directly give the value of "property". With the default setting EdgeCapacity->Automatic, the edge capacity of an edge is taken to be the EdgeCapacity in the graph g if available, otherwise Infinity. With the default setting EdgeCost->Automatic, the cost per unit flow on an edge is taken to be the EdgeCost in the graph g if available, otherwise 1. FindMinimumCostFlow works with undirected graphs, directed graphs, multigraphs, and mixed graphs.